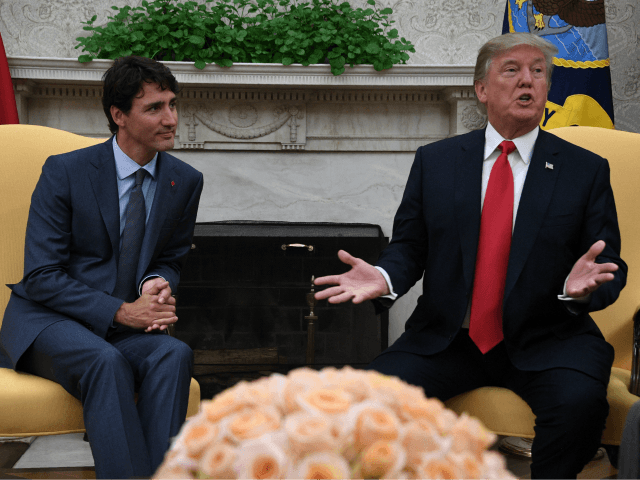 Data from polling firm Angus Reid shows that 56 per cent of Canadians now disapprove of Prime Minister Trudeau while only 40 per cent approve, while polling firm Rassmussen shows U.S. President Donald Trump with a 47 per cent approval rating. 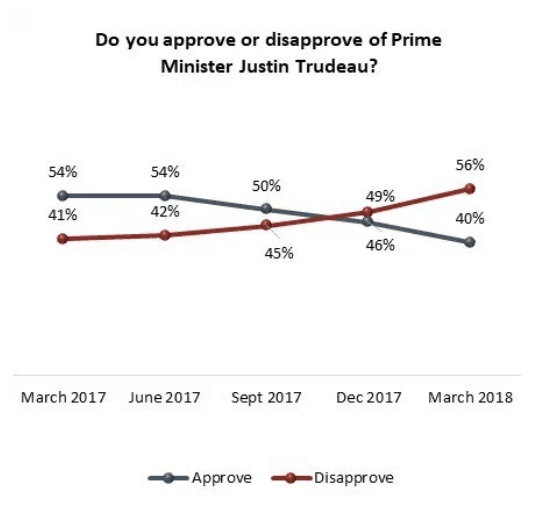 The polling figures for the Canadian Prime Minister is a stark contrast to only a year ago when 54 per cent of Canadians approved of the actions taken by his Liberal government. The Angus poll also shows a surge in support for the Canadian Conservative Party (CPC) and its leader Andrew Scheer who was elected to the role last year. The pollsters predict that if an election were held today, the federal Conservatives would be on course to win a majority. Many factors have likely led to the falling approval rating for Mr. Trudeau, including a recent disastrous trip to India, which was described by critics as a family vacation, where Indian Prime Minister Modi refused to meet Trudeau at the airport and convicted Khalistan separatist terrorist Jaspal Atwal was invited to a dinner. While the Canadian federal elections are not until 2019, two major provincial elections are set to take place in Quebec and Ontario this year, the country’s two most populous provinces. In Ontario, former Toronto city councillor and brother of the late Toronto mayor Rob Ford, Doug Ford, won the leadership race of the Progressive Conservative (PC) Party earlier this month running on a largely populist platform promising to fight for average voters against the establishment. Recent polls have shown Ford’s PC party are likely to win a large majority in the Ontario election in June. Ford is up against current Liberal Premier Kathleen Wynne, who has become infamous for massively increasing the Ontario debt and for her social justice policies such as passing a bill that could allow the Ontario government to take away children if their parents do not accept their child’s chosen “gender identity”. In Quebec, the dramatic rise of the centre-right anti-mass migration Coalition Avenir Québec (CAQ) has sent shockwaves through the province where the separatist Parti Québécois (PQ) and the Liberal Party have long dominated provincial politics. While the CAQ label themselves Quebec nationalists, their leader Francois Legault ruled out any possibility of another separatist referendum in 2014. The party has been deeply critical of the Islamic full-face veil in recent months and has supported a ban on the covering. The party has also been staunchly against mass illegal migration and the party was recently accused of being “ethnic nationalist” by Liberal Quebec Finance Minister Carlos Leitao. Liberal Quebec Premier Philippe Couillard later rejected the allegations saying he did not believe the CAQ were racists. Recent polls show CAQ leading both establishment parties with a recent poll from March 1st, showing the party at 37 per cent.